The above notice was posted on our notice board and I am pleased to say that a number of our members arranged to meet at Alton Barnes over the weekend. This being the first time that any of our members had actually entered a crop circle, we were a bit apprehensive. We had heard all sorts of stories about strange energies, headaches, dizziness and even small coloured balls flying about, so we weren’t sure what to expect! When we arrived at Alton Barnes, we found that everything was organised as to where we would find the circles, how to get there, what tolook for, printout of circle shapes and a questionnaire on what we had dowsed. There was a latest update on where the last circle had been formed. We would all like to congratulate Tony Hathway and his team on all the work they had put in to make it such an enjoyable weekend. The first circle we came to was at White Hill. It was shaped like a three-bladed aeroplane propeller and lay on the side of the hill. Comments from the groups were: “If people think this was made by some jolly young farmer on a night out, they would be way out.” Even if man could have made it, it would have ‘ been impossible to get the accuracy of all the dimensions in one night. We stayed in this circle about three-quarters of an hour, some lying down, feeling the energy all around us. My own feelings were of sifting on a roundabout. One or two members found the energy too strong and- had to leave the circle. After collecting everyone together we asked who had dowsed. We found that we had all experienced some confusion -of thought and had only remembered to dowse at the last moment! 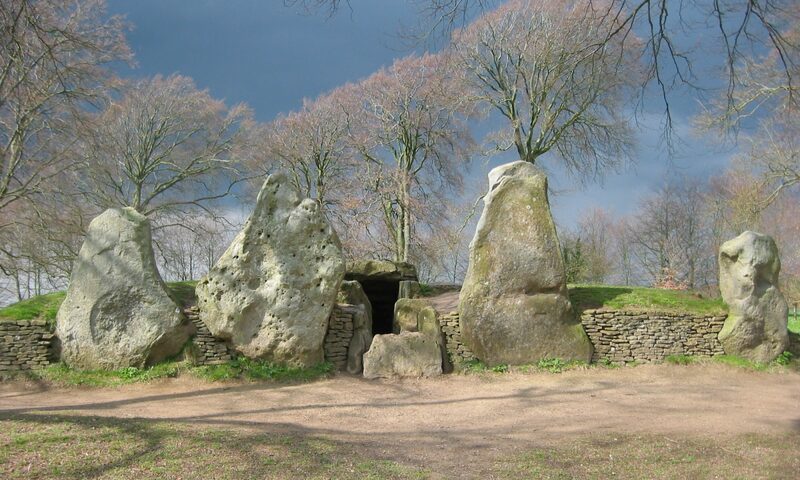 The next circle had only been formed on the previous day and was at Knoll Down, Avebury. We found only a few people at the site and by following the “tramlines” across the corn, we located the circle. We were all immediately struck by its beauty. The fresh green stalks of the corn were layered with the golden heads, thus forming a spectacular coloured matting. The feeling, on entering the circle, was one of peace and almost of something or a world beyond our Earth. Everyone agreed it was a wonderful feeling. We were all amazed at the formation which we could not correlate into any design because of the vastness of the circle. We now have photos of the circle, showing us that there are two centres to it, each with ripples coming from them, similar to the effect of throwing a stone into water. We left this wonderful circle again having dowsed for underground water and earth energies at the last moment., and returned to Alton Barnes for our lunch. I must say we found the food excellent and followed it with a good brew. After lunch we were given more copies of crop circles in the area and decided to go to East Kennet to see the “basketweave” circle, which has 400 “cubes” of standing corn, each about 6ft by 3ft. It was too complicated to visualise how it could have been formed. The layered wheat was almost plaited round the “cubes”. We all came away totally confused. Not far from the basket-weave circle, in the same field, was a wonderful heart shaped circle with an almost lace-like surround of small circles, each about 8ft diameter with, in some cases, forms in their centre like upright corn-dollies. The sun came out and we all sat in a group in the centre of the heart and someone asked “why was this particular shape formed?” We have a rough idea of how the circles are formed but why this shape – a heart? Our group were all old acquaintances and we get on very well with each other, but that afternoon, there was a feeling that I can only describe as brotherly love between us all. Even when a complete stranger came and sat with us we all felt as one. I must admit very little dowsing was done that day, we were all so overcome by the beauty of the circles and the enormous energy they emitted. The questionnaire which we had been given may have been partially filled in by one or two of our most erudite members, but I must apologise to Tony for our failing to complete a good number of these forms. We were all so “high” and bemused by everything and it was out first introduction to crop circles – and we just forgot. The following day, many members of the group phoned me and said how tired they were and drained of energy. I, too, felt the same. Next year we will go again and hopefully do a bit more dowsing! Thank you, Tony and team, for a most enjoyable weekend.